Digital Transformation has been an immensely popular goal for most of the leading organizations. Technology had been discovered to be an immensely important tool that could catapult a business into higher productivity, higher efficiency and a better position to face the turbulence of the future. In terms of the market, change has always been the only constant and adapting to the constant changes have been the most ardent need for all businesses. Technological development has been a crucial theme in business for the last few years and hence many leaders have encouraged massive amounts of innovation within their organizations. With the virtual marketplace emerging as one of the most lucrative industries of this decade, the industry rankings have shifted dramatically. Platforms like Google, Amazon, Uber and Twitter are some of the leading entities in the business sphere. They are also said to be the pioneers in introducing transformative digital practices int he way that they conduct their business. 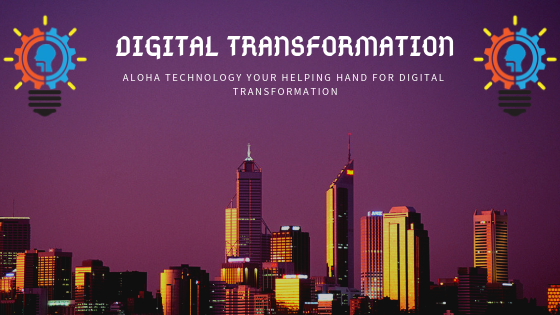 Service providers like Aloha Technology have made it possible for multiple businesses to set up a digital ecosystem around their operations in order to support their business. Corporate Innovation and digital transformation are like two pieces of a puzzle that need to fit perfectly together in order for them to help the bigger picture. An attitude of introducing innovative ideas and practices within the organization is extremely essential for companies to survive the inevitable onslaught of digitization. An organization that is compliant to innovation is more likely to survive unforeseen events like sudden fluctuations in the market or economic depression. Moreover, business leaders need to readjust their expectation from the phenomenon of digital transformation. Businessmen need to look at digital transformation as a ‘means’ that is implemented in order to achieve a business-related goal. Instead of blindly focussing on making the organization digitally savvy, they must reflect on the direct & achievable opportunities that digital transformation can create. If the aim of a company is to merely introduce sophisticated technology into its culture without monitoring the implications of this new addition, it would end up being quite a waste of resources and funds. They must rather try to find business-related problems and explore digitally-guided solutions to these problems. This would reflect a healthy approach toward digital transformation. It would also lead to a trend of corporate innovation. Aloha Technology presents unique solutions that would help companies achieve transformation and innovation. Corporate innovation is a rather multi-faceted term. But it has a direct relationship with the organization culture. The attitude of inculcating innovation in business practices must be deeply inculcated in the organization culture- only then can true transformation be achieved. Organizations having internal innovation labs and dedicated teams are bound to get larger paybacks in the long term. One of the prime requirement would be an open attitude toward brand new ideas and strategies. Organizations must focus on creating practices and ultimately legacies of their own. This will help instill a feeling of motivation toward innovation among employees. Many times, even fairly large organizations find it difficult to conjure up funds for innovative ventures. In a competitive market, the scope to spend on innovative initiatives ends up being lesser than we would like. Moreover, the external economic situation affects the life of an innovative venture that an organization may undertake. Usually, the priority given to first-time innovative projects is much lower than the tried-and-tested initiatives that ensure the profits of a company. The lack of the right personnel, correct training as well as necessary resource mobilization makes innovation even more bleak of a possibility. The ‘return on innovation’ is a crucial factor that guides the probability of an organization indulging in innovative ventures. Since the advent of modern business, operations have undergone a constant cycle of change. Technological evolution has marched hand in hand with corporate innovation. Each new technology which had the potential of resolving a particular business-based issue has flourished in the industry. The most celebrated business leaders have always advised embracing technology. Such a scenario only points toward a future industry that places immense importance upon innovation.